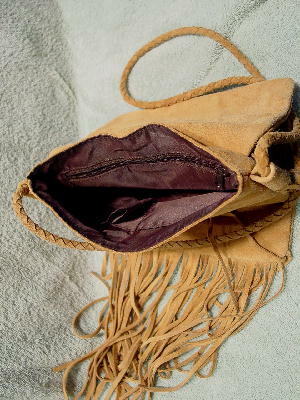 This vintage camel color suede purse has a flap closure and a very nice thick brown triacetate lining. The interior has a back deep zippered pocket. 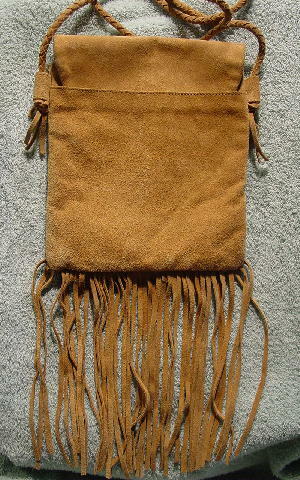 The interior front has two open pockets. The exterior back has a 3/4 open lined pocket. 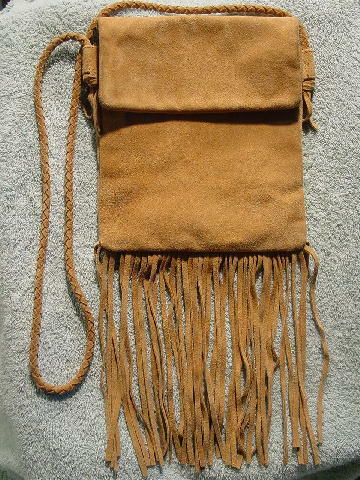 It has a 44" long woven suede shoulder strap. Below the strap holder are three 1 3/4" long fringes. It has 9 1/8" long fringes dangling from the bottom center. There is some light soiling along the flap's edges. She marked a light white 3X in the lining above the zipper, which told her what scene it was for.